Gandalf escapes from Orthanc in the early hours. The Black Riders cross the Fords of Isen. 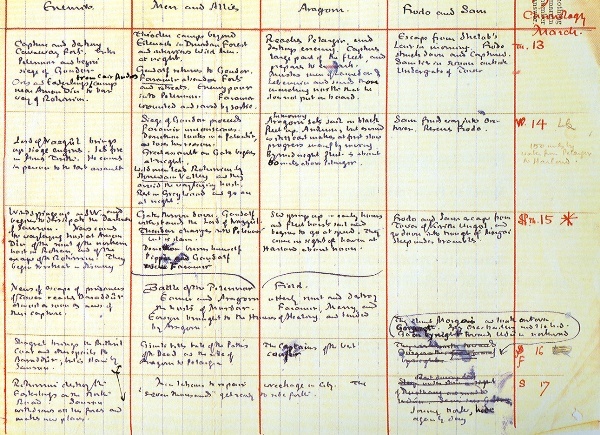 On September 18, TA 3018, Tolkien begins in earnest, the construction of an amazingly detailed timeline for his sprawling saga, The Lord of the Rings. You see evidence of his commitment to leaving nothing to chance in this Synoptic Time Scheme written in Tolkien's own hand. Following this intricate adherence to calendar, we are going to take you on a Middle-earth journey...just as Tolkien laid it out...covering the entire span of the events in The Lord of the Rings, and beyond. So let's get started. There is much to cover, many unfathomable places to see and many, many new friends to make in our journeys through Middle-earth. Bilbo has given the Ring to Frodo and left Bag End never to return. Gandalf has not returned to Hobbiton as promised and a nervous Frodo, sensing approaching danger, has decided to leave the Shire in the company of friends...but without the wizard. Little does Frodo know that Gandalf is in a desperate battle of his own, and danger is indeed galloping towards the Shire at terrifying speed. Perhaps Gandalf is not the only one who underestimated the treachery and ultimately the power of Saruman. It also seems that Saruman, indeed, significantly undermined and disrupted the efforts of Sauron himself, in his quest to reclaim the Ring. All of this comes together with amazing clarity on September 18 if one looks close enough. And that message brought me hope. For Saruman the White is the greatest of my order...Saruman has studied the arts of the Enemy himself, and thus we have often been able to forestall him. It was by the devices of Saruman that we drove him from Dol Guldur. It might be that he had found some weapons that would drive back the Nine. It is Radagast who also tells Gandalf that the Nine have crossed the Anduin and headed westward. In his panic to protect Frodo and ultimately the Ring, Gandalf races to Isengard and straight into Saruman's trap. Lest you think his escape from Orthanc was easy, remember that he was imprisoned there on July 10, and did not escape with the aid if Gwaihir until September 18. Sauron is also moving on this date in his desperation to reclaim the Ring. Being thwarted by the cunning of Gollum, the steadfast watch of the Dúnedain, and the devices of our old friend Saruman, Sauron has sent forth the Nine (apparently the only ones he would entrust this task to) in a frenzied attempt to find the Shire and the Hobbit who holds the Ring. They have been scouring the land for more than 60 days, and just now, on September 18, are crossing the Fords of Isen and approaching Saruman and Isengard...a mere five days before Frodo leaves Bag End with the Ring. They rode through Rohan in haste, and the terror of their passing was so great that many folk fled from the land, and went wildly away north and west, believing that war out of the East was coming on the heels of the black horses.